Regarded in the market to be one of the market bests in fabricating of this Plastic Shopping Bag, we work hard to preserve its quality. Offered product is perfect for numerous purposes. Made accessible to clients at the most affordable rate, the offered product is praiseworthy of high finish. We are recognized in the market for our timely shipments. 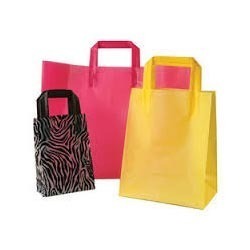 Incorporated in the year 1990, Paras Prints has set up our base at Mumbai as a renowned Manufacturing, Supplying and Exporting of the industry betrothed in offering to our reputable customers an extensive and high-class collection of Polythene Bag, Polythene Roll, Printed Polythene Carry Bag, Plastic Shopping Bag and Plastic Carry Bag and Plastic Raw Material. Developed with extreme accuracy and correctness, we are using supreme grade raw inputs, contemporary and advance tools and machinery in the production process of these products. In tandem with the most contemporary trends of the market, we develop and design these products under the administration of our specialists. Along with this, our provided assortment is highly recognized and commended by our customers for supreme quality and reliability. These features have assisted us in accomplishing the support of an enormous customer support across the sphere.